From the 1911 Census of the Yellow Club, 17 Serpentine Street, Copper Cliff, McKim Township, Nipissing District Mary Frances Awerell, age 28, Head, born February 1883 in Ontario, Irish origin, Housekeeper at Clubhouse, employed 52 weeks, earnings in 1910 $360. ; Annie Elizabeth Martey, age 14, Domestic, born July 1897 in Ontario, English origin, employed 52 weeks earning $180. ; Lodgers Duncan John MacKinnon, age 28, born in Ontario, Scotch origin, Time Clerk at the Smelter, employed 52 weeks earning $950. ; Paul E. Vallmer, age 47, born in USA, immigrated in 1910, English origin, employed 52 weeks earning $2500. ; Laurence Franklin Earls, age 28, born in Ontario, Irish origin, Scale Clerk at Scalehouse, employed 52 weeks, earning $960. ; Elmer Earls, age 22, born in Ontario, Irish origin, Student; Frank Learned, age 21, born in Quebec, English origin, Student; Norman F. Gamell, age 20, born in Quebec, English origin, Sampler at Cobalt Plant, employed 52 weeks, earning $840. ; John E. Campbell, age 26, born in Ontario, Scotch origin, Assistant Chemist Canadian Copper Company, employed 52 weeks, earnings $900. ; Allan Forster Brock, age 21, born in Ontario, English origin, Mining Engineer, employed 16 weeks, earnings $200. ; Charles S. Phillips, age 25, born in Ontario , Italian origin, Draughtsman, Canadian Copper Company, employed 52 weeks, earnings $1000. ; Oswald Stanley, age 25, born in Ontario, Irish origin, Student; John St. Germain, age 23, born USA, immigrated in 1910, French origin, Assistant Mine Surveyor, employed 11 weeks, earning $195. ; Edgar F. Annin, age 23, born in Ontario, Scotch origin, Draftsperson. 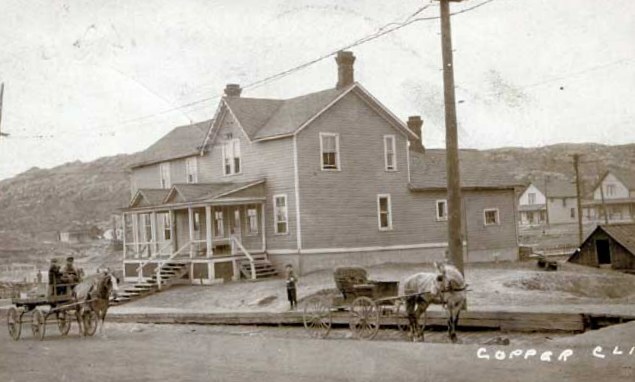 According to the 1911 Vernon’s Directory or Copper Cliff, additional residents at the Yellow Club were Chas Morris, Assistant Mine Surveyor, Canadian Copper Company and Gustav Nyblum, Assistant Chemist Canadian Copper Company. 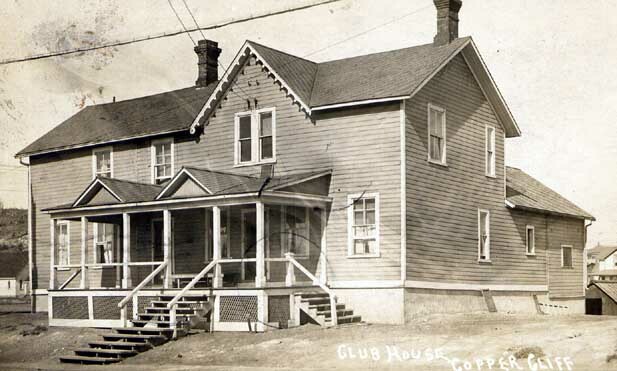 In November of 1913, The Yellow Club minstrel troupe gave an impromptu performance on the clubhouse verandah.